A girl is getting chased by a hooded guy. He kills her. Lucifer is talking to Dr. Martin, but she is sitting at her desk, obviously scared. Dr. Martin wants to know who's in hell and what they're doing there. Lucifer is frustrated. 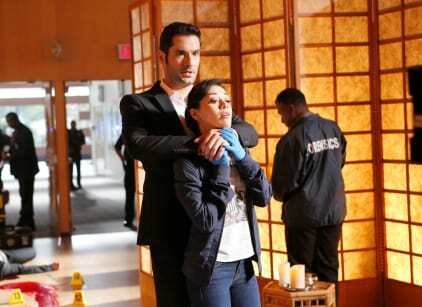 Lucifer and Chloe are headed to the dead girl's crime scene. They see a picture of the crime being committed and Lucifer determines that Azrael's blade was used to kill the girl. Lucifer takes Maze and Amenadiel to Uriel's grave and finds it's been dug up. The blade is gone. The three discuss the problem with the blade being in human hands. Lucifer goes to Ella to ask her to analyze the grave site. She agrees. She whispers what she wants in return in Lucifer's ear. he calls her a "nasty nerd." Chloe sees Ella whispering in Lucifer's ear. Could she be jealous? Chloe and Lucifer visit the yoga place the girl worked at. Lucifer visits Ella to find out information. She restructed the paper that was burned at the gravesite. It seems that it was a map created on Charlotte's law firm's paper. Lucifer visits Charlotte. He's not happy. Turns out Charlotte led humans to the blade to get attention from God. Lucifer demands Charlotte work with him to find the blade or he'll send Maze after her. Chloe and Dan talk about the case. He complains about his pudding being missing. Chloe tells Dan about Ella and Lucifer. Dan seems to think she's jealous. Chloe denies it. Of course. Lucifer shows up and tells them he knows who killed the girl. Maze and Amenadiel are at Duncan Watts place looking for the blade. Chloe and Lucifer show up and find Duncan dead as well as a whole classful of people. Chloe determines that Jenson Glory is the missing victim and might be the murderer. Dan and Chloe talk about Glory. Lucifer is talking to Dr. Martin. Roles reversed. She's laying on the couch. he's sitting in the chair. He's trying to talk to her and she finally gets serious. he gets a call from Chloe that they have the guru. Lucifer comes into the interrogation room looking for the blade. Lucifer is at this penthouse. Maze and Amenadiel come in to tell him they haven't found the blade yet. Ellas shows up at the penthouse. She's figured out that Duncan was the guy at the grave. She wants answers. They hug when Chloe shows up and sees them. It's all a little odd. She has information about the girl Corrine. Lucifer takes off without Chloe. He goes to Corinne's place. She has the blade. She killed the teacher. Chloe shows up. Then the blad is gone. Dan took the blade.He points it at Lucifer telling him, he ruined his marriage. He tries to slice up Lucifer. Lucifer gets the blade from Dan and everything turns back to normal. Lucifer tells Chloe there is nothing between him and Ella. Chloe is releived. Lucifer is with Dr. Martin. She apologizes for being strange, She gets back to business. Lucifer is with Ella. Her favor. She wants him to go to church with her. Lucifer is back at the Lux with the blade when Charlotte shows up. They talk about returning home. Charlotte and Amenadiel agree.